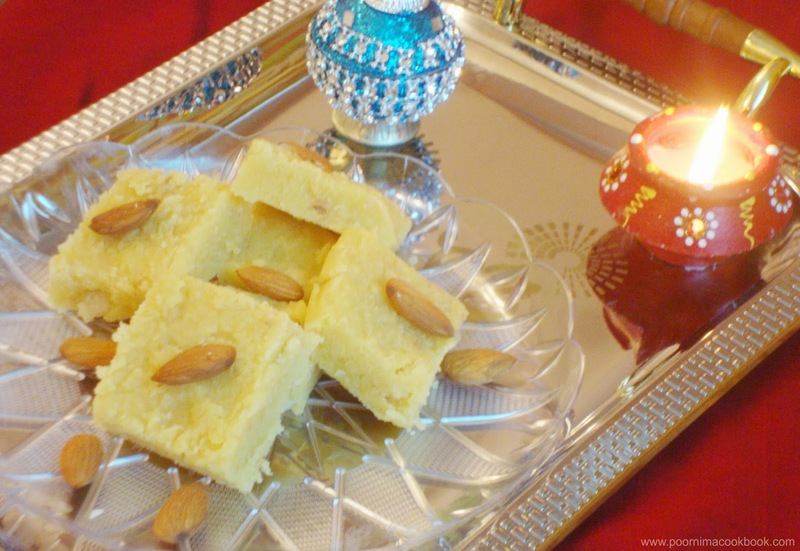 This soft textured Badam / Almond burfi is prepared using almond paste, sugar, ghee with mild flavoring of cardamom. In this recipe there is no - checking of string consistency; so it is suitable for beginners. I adapted this recipe from here and you can complete this recipe within 20 minutes. Blanch almonds and remove the skins; Grind into a fine paste using milk. Measure sugar equal to the amount of badam paste. Grease the suitable plate with ghee and keep aside. Heat a heavy bottomed pan, add badam / almond paste, equal mount of sugar and 1 tbsp of ghee. Continue mixing in medium flame, add yellow food colour ( if using) and caramom powder. Add in regular intervals and keep stirring continuously over medium flame until the mixture starts to leave the pan and become a thick mass; switch off the gas. Special tip for beginners: If your burfi tuned out too soft and not able to cut into pieces, just transfer the mixture again to the pan and stir for another 3-5 minutes; pour into the greased plate.